Straight from the pen of Aaron Sorkin and starring Jeff Daniels, Emily Mortimer and Alison Pill, HBO’s The Newsroom is released this week on DVD and Blu-ray. A behind-the-scenes look at US journalism, Sorkin’s latest has met with mixed critical and public opinion, yet remains a fascinating experiment in imbuing fact with fiction. After a rousing yet incredibly derogatory speech about how America is no longer the ‘greatest country in the world’, anchorman Will McAvoy (Jeff Daniels) returns to his Manhattan office to discover his news team has jumped ship to the 10 O’clock slot and his ratings are haemorrhaging. Will’s supportive boss, head of ACN news Charlie Skinner (Sam Waterson), sees this as an ideal opportunity time to shake up McAvoy’s slot, hiring MacKenzie McHale (Emily Mortimer) – Will’s ex-girlfriend and former executive producer – to lend a hand. Their fruitful, if volatile chemistry successfully culminates in a vibrant broadcast built around high-minded principles and informative debate. Thus, The Newsroom is at it’s best when news is being broken. Set in 2010, Sorkin is able to reconstruct previous news stories, correcting the moral mistakes made by real television networks and presenting us with a model for ethical broadcasting. 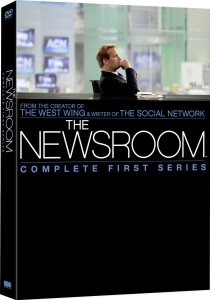 Darting from desk to desk with intoxicating urgency, Sorkin has distilled the frantic energy of the studio floor, effortlessly romanticising the medium of broadcast news. His machine gun prose gracefully encapsulates the newsroom vernacular as dialogue is exchanged, with each bullet a succinct signal of intent fired directly into the heart of its target with breathtaking accuracy. However, whilst Sorkin’s rousing script suitably articulates McAvoy’s single-minded mission to civilise, The Newsroom’s random diversions into contrived sitcom slapstick and artificial romantic dalliances feel all too jarring. Each episode also suffers from a lack of momentum and when focus switches from the dramatic breaking stories at hand. Sorkin’s latest endeavour often finds itself pandering to mainstream audience’s taste for reality television, romantic comedies and an inherent lust for celebrating what it means to be American. This underlying jingoism reaches its nadir during an episode that covers the assassination of Osama bin Laden. Watching our apparently principled newsmen and women high-fiving and celebrating without once seeing the irony in their actions leaves a rather unsavoury taste – ultimately succumbing to melodrama, sensationalism and artificial patriotism. Initial (and largely positive) critical response to Season Two – currently premièring in the States – does appear to indicate that these various teething issues are being resolved. Whilst The Newsroom is undeniably guilty of pandering to mainstream sensibilities, Sorkin’s prose, Daniels’ charisma and the fast-paced vivacity of the ever-dynamic world of current affairs offer more than enough reasons to keep you switched on.